“Durians are not allowed inside the building”. In South-East Asia, you’ll find this kind of sign in hotels, travel agencies, etc. Judging by the drawings, it’s the smell of the fruit that seems to be the problem. And in the summertime, which is high season for fruits, you’ll hear about people dying from durian overdose. Still, this fruit is one of the bestsellers here. So, what is true and what is not? Let’s start with the smell. Yes, the durian has a very strong smell, it’s a fact. It is not sold at the same place as the other fruits in the covered markets of the Philippines, because its smell is heavy, but also hard to get rid of. They will rather place it on stalls close to the open air than put it in the heart of the market. Because it would contaminate the olfactive atmosphere of the whole building. The first time you encounter a durian, you don’t immediately understand what’s going on. The air is full of a thick, sweet, new smell, that is hard to associate with the fruit at first. Because, for Westerners, when you think about fruit, you think of a light, fresh, luscious smell. And the durian is far from this definition. Its smell is heavy. Fat. Deep. Intoxicating and complex. So, at the beginning, it’s hard to tell this smell comes from one single product. It seems more like a lot of different smells are put together. Some say this smell is like a decomposing corpse. I wouldn’t go that far. It is not the same, but it is still very persistent. It doesn’t leave you. Just sniff it and you’ll keep it with you, carrying it around for long minutes. And when you bring durian in a confined space, like most shops and hotels, that keep doors closed because of the AC, the smell won’t go away, oh no, it will stay. Some people love it, some other hate it. But, it cannot go unnoticed. Even though the smell is familiar, you can never forget that it’s here. Even when you’ve been breathing it for hours. Once you have clearly identified this smell, after a few encounters with the durian, you cannot go wrong. You know exactly what it is. Then, when you have a taste of it for the first time, you’re not surprised. Its taste is the solid expression of this smell. Very sweet, complex, persistent. Naturalist Alfred Wallace, specialized in South-East Asia and more particularly the Philippines, Indonesia and the Malay archipelago, made a vivid description of he aromas of durian on his first trip to Borneo, in the 19th century. It seems like reading Alice in Wonderland and the absurd taste of the shrinking potion that Alice drinks: “a rich custard highly flavoured with almonds”, with notes of “cream-cheese, onion-sauce, sherry-wine”. 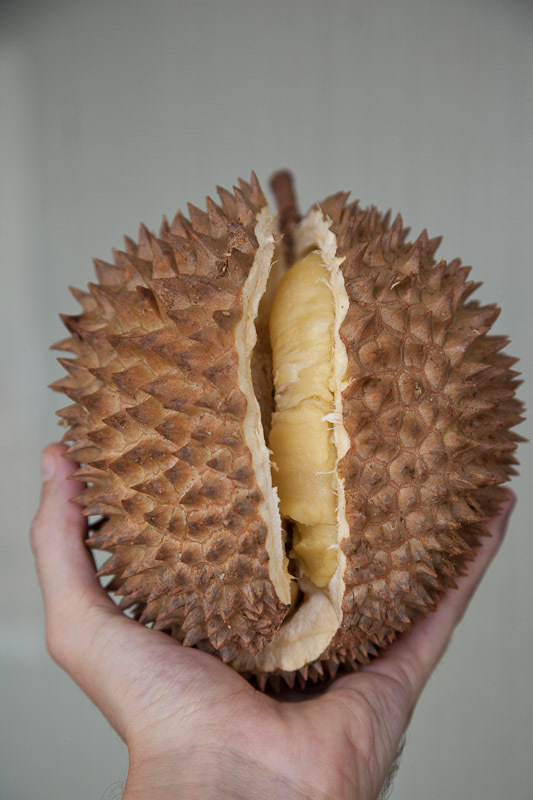 Of course, durian lovers and most Asians will find this description completely untrue, but the first taste of durian for a Westerner can be that confusing. Just one bite and you won’t get rid of it. The powerful taste is followed by an even more powerful after-taste. You can eat all you want to cover it, but it will not leave you that easily. You might rather get a weird mix of the taste of what you’re eating and the after-taste of the fruit that won’t let go. Sometimes, when you think you have finally beaten the taste, after brushing your teeth 4 times, 2 hours later, you will have a strong tendency to burp. Yes, durian is sneaky. It is not easy to digest. And with the burping, you get the taste all over again. So the durian stinks and has such a strong taste that you might not want to try it twice if you did not like it the first time. In South-East Asia, at the very same place where it is forbidden in commercial buildings, people enjoy it, they love it. It’s called “king of fruits” here. It is a beautiful fruit. Its skin is very graphic, covered with thorns. It’s impressive. It is also big, sometimes huge: around 30 cm in length and 1 to 3 kilos, up to 7 kg for some varieties. With this size and this crazy armor, the idea of sovereignty on the kingdom of fruits makes sense. And as it smells stronger than all the other ones reunited, we can therefore agree on the fact that it is superior to them. In its own way. But it is also praised for its rich taste. The durian has a unique consistence that can surprise the newbies. Under the thorny shell, five white cells are full of a pale pulp. It is dense, juiceless, and its creamy texture somehow can remind of avocado. You can tell immediately that it is very rich. Asians love this richness. We, Westerners, have trouble not worrying about the smell and the unknown taste. We just keep thinking that it smells weird, and if it smells weird, well, there must be something wrong. The locals love it for its beauty, its rich texture and its complex taste. Some animals love it too. Even tigers, yes it’s strange. But they have to be careful. Durian is not completely harmless if you eat too much of it. In the South of Mindanao, the fruit season starts in September. 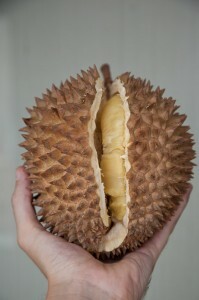 Durian then become available in huge quantities and their price go as down as 30 pesos (50 euro cents) in some places. It only happens once a year. About 9 months a year, durian is almost impossible to find. So people go crazy. A bit like me when the trompette zucchini appear on the markets of the French riviera. They buy kilos of durian to satisfy the craving they’ve had for months. And they know that the season will be short, so they have to make the best of it. My friend Donna is from Davao and lives in Gensan, two cities where durian rules. She explained to me that, each year, several persons in the Philippines die from durian overdose. She has been advised to drink soda to help digesting the fruit, and most of all, not to drink any alcohol with it. 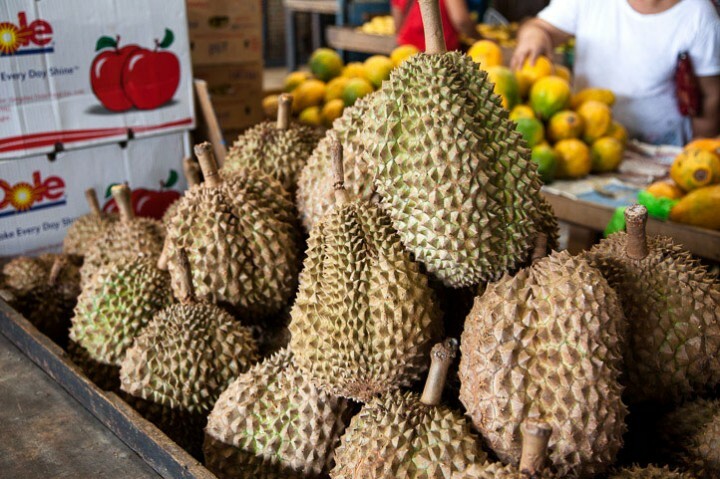 She also told me that durians were dangerous for people suffering from high blood pressure. The overdoses are real. Every year, some deaths are reported by the press in Thailand, Indonesia and in the whole region. Indeed, it’s dangerous for people suffering from hypertension, and also for pregnant women. But the worst association is durian mixed with alcohol. Japanese scientists from the Tsukuba university have recently found that durian, apparently because of its high sulfur contents, is capable of inhibiting aldehyde dehydrogenase or ALDH, which is the enzyme that our liver secretes to protect our body from the toxic byproducts of alcohol. 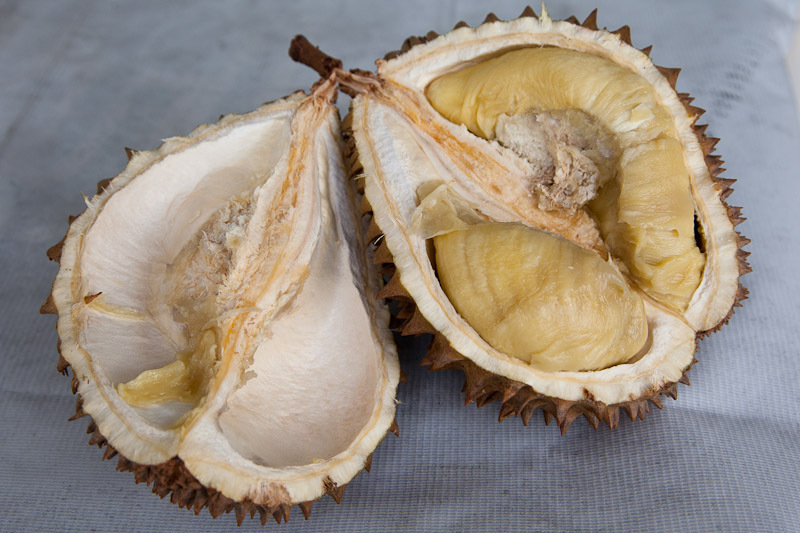 When you know that, naturally, 50% of Asians have a partly inactive ALDH enzyme and are more subject to alcohol intoxication, it gives you an idea of what can happen if they dare the devil and, to pile on it, eat durian while drinking. The result is not very pretty : dead bodies are found, their mouth covered with white foam, as if they had rabies. You can find an example of that kind of story in this article from the Jakarta Post. Anyway, you shouldn’t eat too much durian. Because it is highly nutritious and very rich in sugars and fats. It’s one of the most caloric fruits. Almost the same as avocado. Twice more than olives. It’s a lot to take for your stomach. Still the durian is eaten, a lot. Indonesian people believe it has some amazing properties, for instance it’s considered a great aphrodisiac. And there is this impressive look that makes it stand out from ordinary fruits. Also, being seasonal, it is awaited and makes amateurs go nuts when it shows up. Finally, it is weird, which is probably one of its strongest qualities. It tastes and smells like nothing else. It is singular and strange, with a hint of danger. So eating a simple fruit becomes a real adventure. You should try it some time. You will never forget it. You exaggerated alot in this article. durian does not taste bad. I highly doubt people are found foaming at the mouth. The taste is subjective. But the stories about foam are true. Been there? Read about it in the papers? Talked to a doctor about it? If not, do it, we’ll be able to talk afterwards. Don’t just assume. I agree with Sunny; you really did exaggerate a lot about the smell of durian. I’ve had the misfortune in my life to come across the remains of a decomposing human corpse and it smelled nothing like durian. Now, that having been said, I must say that I always find it amusing when my fellow cheese-eating Westerners complain about the smell of durian. After all, we all know what cheese smells like to an Asian. Wonderful article : ) . arrived here through Wikipedia… looks indeed like a strong-personality fruit – with extreme reactions from the consumers – you’ll never please the lovers/ haters ^_^ . Also had a look at the cashew nuts series (never imagined their whole story!) – you write very well. : ) ….looking forward to explore the rest of the info you put on this blog!